Our highly trained journeyman plumbers/gas-fitters and technicians are able to service all of your pool and spa equipment. 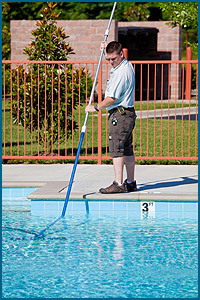 Our trained technicians can provide outdoor pool and spa start-ups and shut-downs. We offer a complete line of pool and spa chemicals by Mursatt Chemicals. The Mursatt Chemical line is an industry leading product that we have trusted and used for decades. We also offer a full line of Taylor Reagents and test kits for comprehensive water testing. We provide water testing at our shop and then use the computerized Mursatt Water Analysis Program to provide a computerized chemical prescription based on your customized pool and spa information and your preferred Mursatt treatment products.